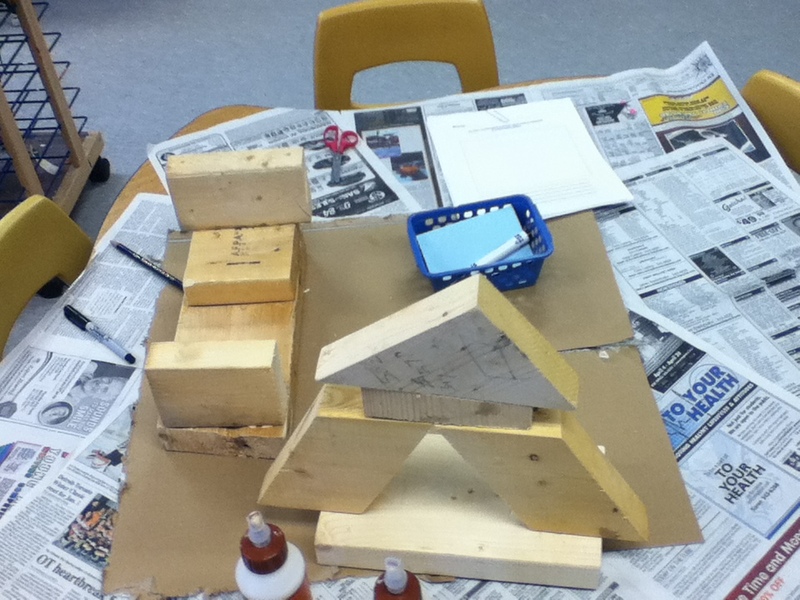 In continuation with our beautiful stuff project, the children used real wood piece to create home, buildings, bridges and other various structures. 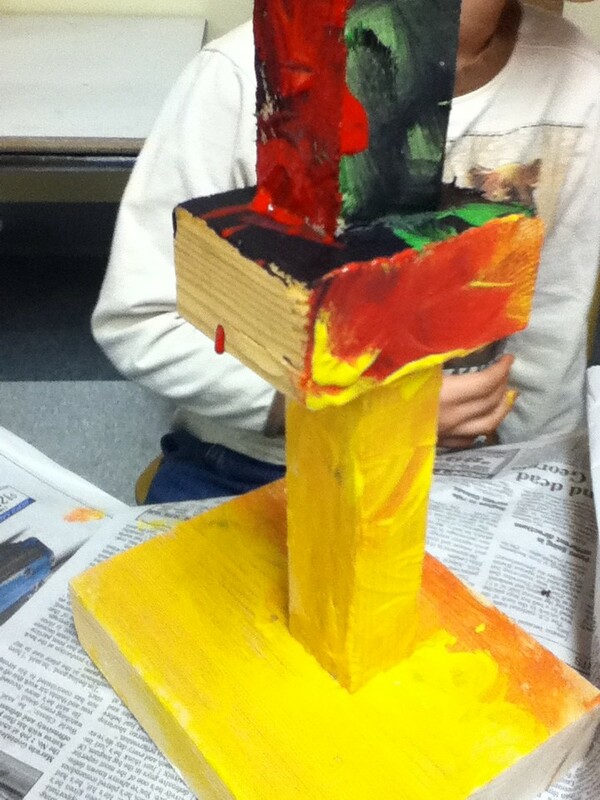 The children created, draw their designs, labelled some parts, glued and painted their designs. It was a great and fun experience. 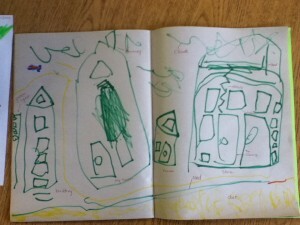 This student independently drew a picture of his neighbourhood when we were writing in our journals. 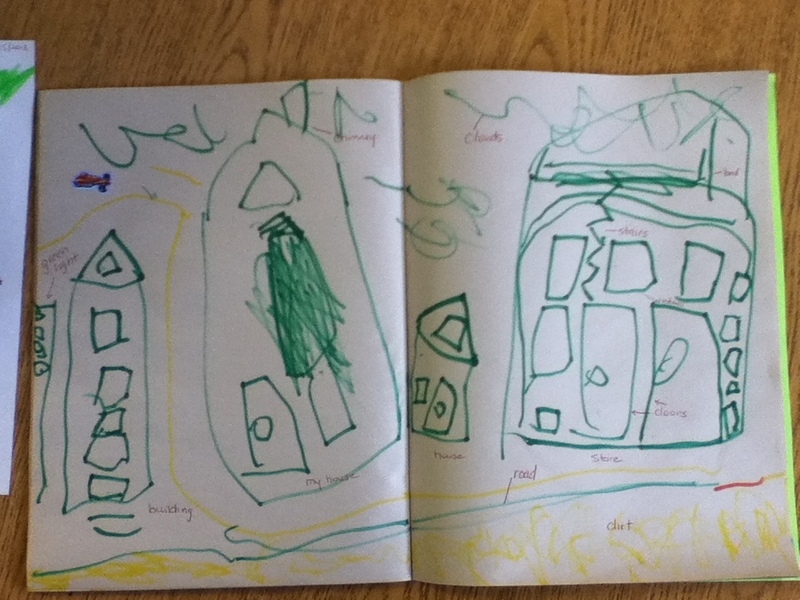 He carefully selected shapes that are parts of a building, told me about the buildings-some stores and houses and added stairs that go to the bed on the top floor (blueprints show stairs!). Inquiry allows students to make decisions about their learning and to take responsibility for it. The classroom should be warm and inviting to students, and the Reggio Emilia approach is to have the classroom serve as a “third teacher”. think about large and small groupings-tables in my classroom are incorporated into centres as well as for snack. This way they have a multi-purpose and it reduces the amount of large furniture. I also have no desk, but I have 2 filing cabinets one for my daybook and supplies and the other for files. starting on p.32 some recommended learning centres are listed discussing there purpose, observation pts, material lists, furniture, and a suggestion for location. In our classroom, my ECE partner and myself think about making it a “home like” environment where the walls have little commercial bought products, but picture frames handing where we will eventually display children’s art work. I purchased a few plants, we are going to add some lamps to create a cozy feeling in our reading corner, and last year we had some birch branches cemented into flower pots and strung with white Christmas lights to add that outdoor feel to our science centre. In the first few weeks we have just enough materials out, so that we can observe, establish routines in the classroom, get to know the children and their strengths, and to see what they need to develop their learning. 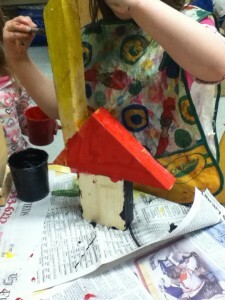 Some centres are permanent like building, but the items within it will change. For the past couple of days, I have been ensuring that each child in our Early Learning Kindergarten class had an opportunity to conduct a survey. Once each child was done, I met with them individually to assess their knowledge of what the survey meant. I asked them to tell me something about the survey using the word “more” and something using the word “yes”. Almost every child told me which column had more, and which had less, using complete sentences. I think this knowledge comes from the graph we do every morning. Now that I know the children are capable of interpreting surveys and graphs, I decided to use a different survey. In the Nelson Mathematics book, there is a survey that you can reproduce that says “Do you like ___ more than ___”. I photocopied this survey and used “apple” and “banana” for the blanks. I used stickers for those that can’t read the words. The first group of children today enjoyed this survey too. 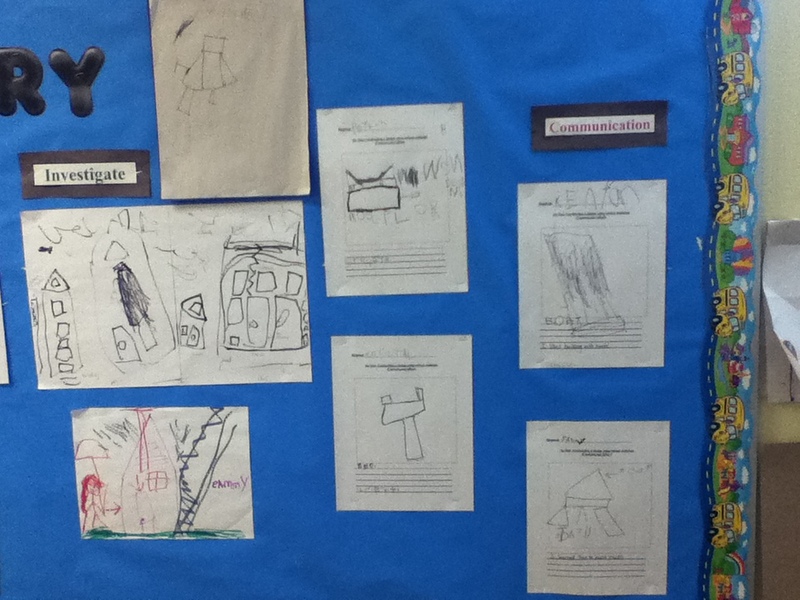 I left additional copies in our math centre, and a few of the children chose to do the survey during play time. This week, we learned about the letter B. We did several play-based literacy activities throughout the week, but the one the children enjoyed the most was bringing their bears to school for a day. We let the bears sit on the carpet for large group instruction. We read “Goldilocks and the Three Bears” to them. We sounded out the word bear, focusing on the “b” sound. Just before our lunch time, we got each child to get one snack out of their bags. We all sat in a large circle on the floor and had a Teddy Bear picnic. The kids thought it was great! While we had snack, we thought of names that started with b, sang the Teddy Bear Picnic song, and had enough time left before the bell rang to play “I Spy” for letter b’s in our room. It was a really fun way to reinforce this letter! Our students have been bringing in cars and trucks from home recently. 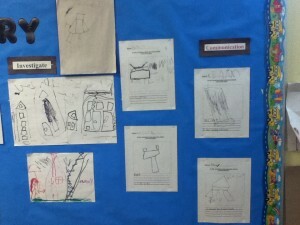 Transportation is a great lead into talking about shapes My teaching partner and I decided to expand on the children’s interest and began integrating 2D shapes into our math centre. 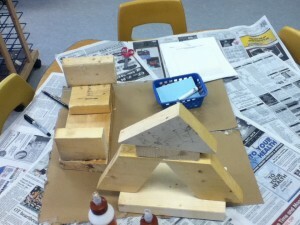 On Monday, we put sand molds that are shapes into our sand table. We had to start a list of names of the children who wanted a turn to play in it! Their enthusiasm lasted all through Tuesday. It remained the most popular centre in the room. On Wednesday, we put a turtle matching game in the water centre. The turtles’ backs are shapes and the shape on their shells are cut out. The children have to match the shapes to fit the shells onto the turtle. The children loved this activity too. Today they asked if we could take the water centre outside for recess so they could continue to play in it. Luckily, it was a beautiful day so we could! Tomorrow, I am going to have a “Shape Hunt”. I cut out enough shapes for each student. While they are outside for recess, I will hide them around the classroom so we can go on a hunt for them once we are back inside. My teaching partner and I believe in using our playground as a classroom extension. Children can learn valuable skills while playing outdoors. For example, in the sandbox, they learn spatial awareness while building creations. They also use creative thinking, problem solving, turn taking, sharing, and can recreate the world they know. Children can also develop their gross motor skills outdoors. They have room to run, jump, tumble and play co-operative games. There is playground equipment they can climb on, swing on and hang from. It is also an amazing time for science. Children can find insects, caterpillars, plants, flowers, etc…and these can turn into valuable teachable moments. Today, it was a beautiful Fall day. So, we decided to dedicate our free play time this afternoon to the great outdoors. We headed outside with pails, shovels, balls, scoops, skipping ropes, and cars for over an hour. I hope we have more beautiful days like this to enjoy, and to give the children the time outdoors they need. And the Junior Kindergartens Arrive…. Today was the first day for our Junior Kindergarten students. Our school board decided to implement a “gradual entry” for the Full Day Kindergarten classes this year. For the past 2 days, we have only had our Senior Kindergarten children. Today, we had 16 new children walk into our classroom. Most of our new friends had visited the school last June. Some of them had never been there before. When the morning bell rang, my teaching partner and I were already outside. We went onto the playground early to welcome the children as they got to school, as well as speak to some of the parents. When the bell rang, and we tried to show them where to line up to go inside. I am not sure if we had more children or parents who began to shed some tears! It was a proud moment for those parents, but it was a scary moment for those children (and some of the parents too!). We tried to reassure everyone that it was going to be a great new adventure, and headed inside. A few of the children were still teary, but we were lucky….our principal came into our classroom and he assisted us in comforting the new children. He stayed in our room until all of the children had settled in. The rest of the day went by quickly, but by the end, we were proud of all of students. Our Senior Kindergarten children helped the new students throughout the day with routines, and the “rules” of the room. Our new students, once settled, became excited about being at school and enjoyed their first day of school with us. 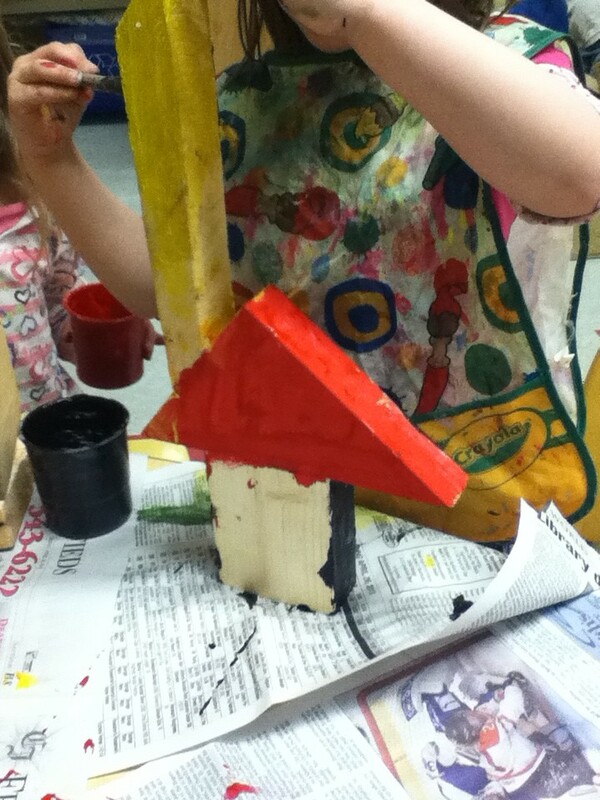 We gave them large blocks of time to play so they could learn about our classroom. This also gave them time to meet and interact with the other children in a non-structured, non-threatening way. I am looking forward to tomorrow!